Summer is the time when Hollywood brings out major action and superhero movies. This year’s season started around Memorial Day with The Guardians of the Galaxy Vol. 2 and it continued with Pirates of the Caribbean: Dead Men Tell No Tales, Transformers: The Last Knight, Wonder Woman, Spider-Man: Homecoming and this just a list of the most successful ones so far. One of the latest films in this category is Valerian and the City of a Thousand Planets. The movie is based on a classic French comic book “Valerian et Laureline” from 1950’s and as such the story pre-dates Star Wars but it is quite similar in many aspects. We see a universe full of hundreds of species coexisting on various planets dominated by a universal government very much in the style of Star Wars’ Empire, there is a quest to save the last inhabitants of a destroyed planet by a couple of young protagonists who are pure of heart but endowed with great fighting skills, and we get to explore one fantastic alien world after another. The movie is a spectacular visual feast with images that rival Avatar and it features an impressive performance by Rihanna but what is most interesting here is the back story of the U.S. versus non-U.S. movies at the global box office. Valerian was directed by the French director Luc Besson and produced by his French company Europa Corp. – an outlier in the industry that is dominated by American movies. Besson is practically the only French director whose movies have met with regular Hollywood success while retaining their French roots in terms of production and casting. Even his early French action films (La Femme Nikita, The Professional) have been successfully released in the US, his 1997 sci-fi feature The Fifth Element is a cult classic and Lucy, starring Scarlett Johansson and released in 2014, was an international box office hit that grossed $463 million. He is also a creator of the franchises Transporter and Taken which have made Jason Statham and Liam Neeson household names in the action genre worldwide. Besson has a great reputation as a writer/director of exciting action movies, a solid producer who delivers movies on time and within a budget, and smart businessman who has a total creative freedom thanks to his preselling movies internationally and thus bypassing any creative interference by Hollywood studios. Besson is an outlier not only in the U.S. but also in his own country. A typical movie produced in France has a fairly limited budget, it may be a comedy or a drama but not a science fiction (again, budget constraints) and it would feature French actors not international stars like Scarlett Johansson or Clive Owen. Besson manages to straddle the two worlds by using a French intellectual property (in this case a comic book on which Valerian is based), and making the movie outside the Hollywood studio system but at the same time ensuring its worldwide launch that competes with the heavyweight blockbusters. Early box office result point to a failure – the movie opened to only $18 million U.S. box office going head to head with Dunkirk that opened to $50 million – but Besson may still come out ahead. 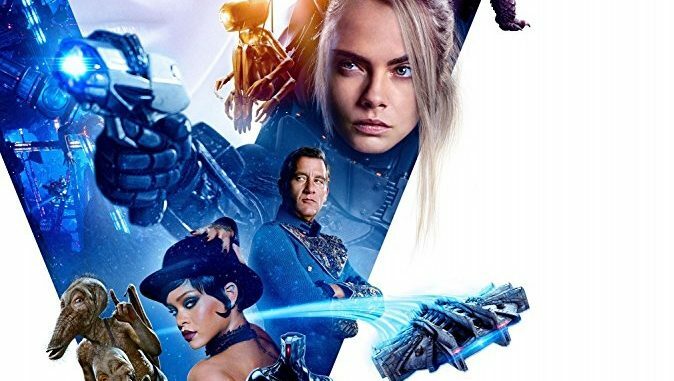 His classic sci-fi movie Fifth Element failed its box office opening 20 years ago but it has been playing worldwide ever since, Valerian’s release in China is still coming up and it may bring a gross of several hundred million, and his production cost is diminished by a myriad of pre-sale deals. What is interesting is that Valerian with its decidedly non-U.S. roots is an exception that shines a light on how much the American movies are an unbeatable intellectual property. Apart from technology, entertainment is one of the most reliable and successful U.S. export industries. In 2016 the U.S. movies brought in $27.8 billion in foreign box office (i.e. theater receipts outside the U.S. and Canada). Hollywood movies enjoy an unquestionable world dominance and they constitute the majority of films shown in such disparate countries and cultures as Russia, Japan, Brazil, and everything in between. No film industry in the world can survive without a regular supply of Hollywood blockbusters. In China, the state film authorities maintain two protective holiday periods (around the Chinese New Year and in the summer) when foreign movies, mostly American, are not allowed releases in order to protect the local film industry. This can result in dramatic box office slumps as it happened in China last year- a direct proof of U.S. movies’ power in the local marketplace. In the domestic market, American productions dominate almost entirely. If a movie is not made in the English language, chances of its release, especially a wide one, are very low. U.K. and Australian movies are exception to this rule for an obvious language reason, whereas some foreign films are released in limited runs, often in arthouse theaters. The rest of the box office grosses comes from the domestic production. This is why Valerian is a rarity- it is major special effects action adventure that opened in the U.S. in 3553 theaters but for once it really is not an American movie. So, thanks to Luc Besson and his labor of love (he has been dreaming of making Valerian for decades but the technology was not there until Avatar came along), here is an opportunity to see a very unusual summer popcorn extravaganza. It is French movie but shot entirely in English, it has a comic book origin but from the material unknown in the U.S., and it is a creative vision of a European artistic disruptor whose failures are as interesting as his successes.